Chances are you didn't buy a bunny for your child this Easter. I know this because according to The Humane Society, sales of bunnies are down this year. That's a good thing, since many American kids fervently love their bunnies until the Tuesday after Easter. So that got me thinking... since fewer bunnies were purchased this Easter, there must be lots of extra carrots around. And what better way to use up carrots than in carrot cake muffins? 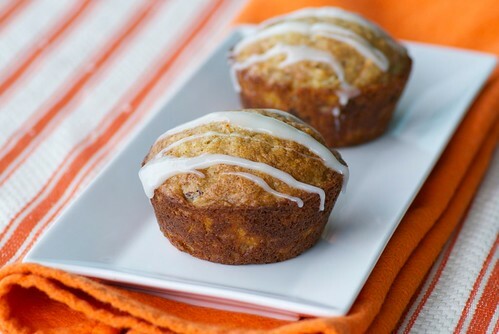 These muffins are a tasty collision between Morning Glory Muffins and classic carrot cake. The sweetness of the grated carrots, crushed pineapple, plump raisins and toasty coconut is balanced by earthy walnuts and spicy cinnamon and vanilla. Since carrot cake cannot be eaten without cream cheese, each muffin is topped with a heavy drizzle of pineapple cream cheese frosting that's good enough to eat by the spoonful. I know. 2. In a large bowl combine flour, sugar baking powder, baking soda, salt and cinnamon. Stir well. In a separate medium bowl, whisk oil, eggs, vanilla and crushed pineapple. Add slowly to the flour mixture, stirring well until flour is thoroughly dissolved. Gently stir in carrots, walnuts, coconut and raisins. Pour batter into the prepared muffin tin. 3. Bake for 25 minutes, or until the tops are golden brown and a cake tester inserted into the middle of a muffin comes out clean. Transfer to a wire rack to cool for 5 minutes before removing. 4. To make the pineapple cream frosting, combine cream cheese, confectioners' sugar and pineapple juice in a small bowl and whisk until smooth. It should be on the thick side. Using a small spoon, drizzle frosting over muffins. If you'd more frosting, the coat the entire muffin top. is this frosting okay to eat by the spoonful? That's all I can think about. Carrot cake has always been a favourite around here. There aren't too many extra carrots because you made muffins and I made a big batch of carrot cake cupcakes. Great minds think alike! They look lovely, only chocolate bunnies in this house. There is definitely no better time of year to indulge in carrot cake than right now! I'm loving the sound of that frosting! These sound wonderful-and great idea to drizzle rather than slather on an inch of the icing! These look so good it should probably be illegal. I want that frosting for dinner. I'm embarrassed to admit this, but I've never had carrot cake. Is it really spicy? val-I'm glad to hear it. lynn-Ha! The bunnies better be careful. We're infringing on their territory. jennifurla-I hope they're solid and not hollow. The chocolate bunnies, that is. joanne-There is something essentially springy about it. susie-Thanks! I like the way it looks better. bakergirl-I wouldn't hold it against you! jen-That's quite alright. These muffins are mildy spicy. Some versions can be spicier, especially if they use nutmeg, dried ginger or cardamom. Hope you try it! Good heavens! How out of touch with modern life and mores do you have to be to still be giving bunnies for Easter? Living under a rock, perhaps? In a cave? Oy. Good news from the Humane Society, in any case. And a very nice recipe! Thank you! My favorite cake! I cannot deny a carrot cake recipe - no matter how many versions are out there. These sound delicious - and reasonably healthy. Can't wait to try!